Chandigarh 09th May:- After being global, the Punjabi Film Industry is proceeding with films which carry a different zone, a different track, lot of comedy movies with beautiful punches and jokes which actually tickle your stomach and of course the films which carry a message which is a good sign for the rise of the Punjabi Cinema. And under the series of comic films another feather is going to be added with name as “Marriage Palace” which will be directed by Sunil Thakur. The film will be made under the banner of Happy Goyal Pictures and its Producers are Happy Goyal and Harsh Goyal. . The star cast of the film includes Sharry Maan, Payal Rajput, Jaswinder Bhalla, BN Sharma, Sumit Gulati and Umang Sharma. The story, screenplay and dialogues of the film has been written by well know writer Rakesh Dhawan. The Project Designer and Co-Producer of the film is Shubham Chandrachur. The announcement of the film was done by its team here today. 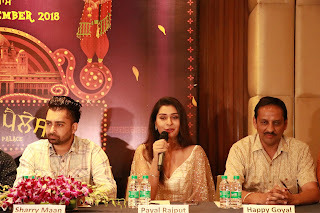 Versatile singer, Sharry Maan, lead actress Payal Rajput along with with Producers Happy Goyal and Harsh Goyal and the Director Sunil Thakur interacted with the media on this film announcement which is going to be made under the banner of Happy Goyal Pictures and for which the shooting is going to start from 25th June, 2018. The Director, Sunil Thakur, said that we can’t reveal much about the story of the film at this moment but this film is going to be a mixture of entertaining punches and jokes which is going to be enjoyed by the audience. He further added that he believes that film making is the greatest art and there is an unlimited scope of experiment and innovation for which he is completely ready now. The lead Actor Sharry Maan, said that we are happy to announce this film under this maiden Production House, Happy Goyal Pictures and about the movie as the name says, “Marriage Palace”, he is sure that this one will entertain the audience to the to the fullest. The lead actress, Payal Rajout also added that she is happy to be a part of this film and act with this versatile and melodious singer Sharry Maan, in hope that this movie will do good the whole team. Producers, Happy Goyal and Harsh Goyal said that they are proud to get associated with a team like Sharry Maan, Payal, Rakesh Dhawan, BN Sharma and Jaswinder Bhalla and look forward for a good cinema. The shooting of the film will be done in and around Punjab.